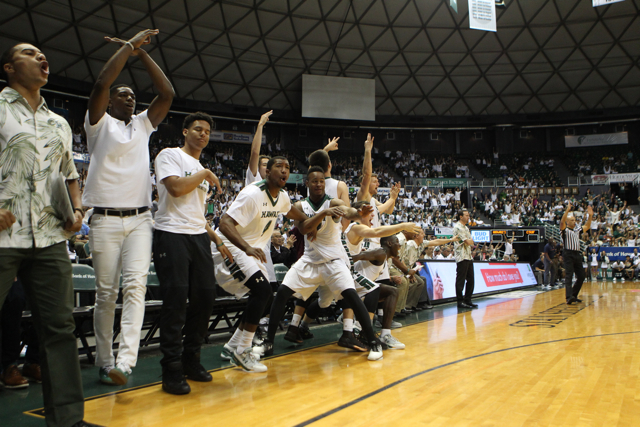 Fans of all ages can celebrate the University of Hawai’i basketball team’s 2016-17 season at the annual Awards Banquet on April 11. 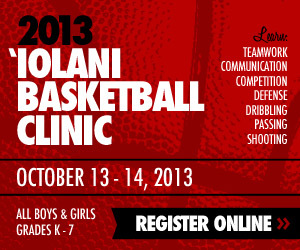 The banquet will take place at the Hilton Hawaiian Village’s Coral Ballroom. No-host cocktails will begin at 5:30 p.m., with the program to start around 6:30 p.m.
Tickets are $150 per person, and proceeds will go towards summer school scholarships for the men’s basketball program. The 2016-17 Warriors finished 14-16 overall and in fifth place in the Big West Conference at 8-8. The Warriors, who were under unresolved NCAA sanctions until the final week of the season, exceeded preseason expectations as they were picked to finish eighth in the Big West Preseason Poll. For more information about the banquet, call 956-6501. Congratulations to all the players and coaches for not letting the NCAA sink this program. This team this year did the best it could do and surprised everybody by getting 5th place. With all the NCAA’s unfair punishments and late answers on the appeals, this team could of rolled over and play dead but they didn’t. They fought hard in every game, even the losses. Now everything is back to normal and I see this coaching staff leading the program back to the top! Lets Go Bows!!! YES !!! Upgrade the schedule. Nice post !! Go RunBows !! Brian McInnes posted some nice Dleague highlights of Jankovic. Looking great! Hope he gets a chance soon. Go Bows! I’ll wait for video of Banquet festivities. Go Bows ! thanks, akuhead2. I guess Sioux Falls (Heat) traded Janks to Erie (Magic) a few weeks ago. Janks started for Sioux Falls early, then got injured and wasn’t seeing much playing time after that. Now, he’s starting for Erie. Scored 29 in one game, which earned him a starting job. FWIW: Erie acquired Janks on March 1. In seven games, he’s averaging 16.0 points, 6.2 rebounds, 2.0 assists in 27.4 minutes. He’s shooting 52.5 percent from the field and 81.5 percent from the FT line. Who’s Next Up (Recruiting) ? Obviously, nothing that’s mentioned on this blog will influence Ganot’s recruiting. That said, wonder if he’ll take a look at an all-state guard (not Hawaii) who recently received his release from an NLI with a Big West school? Intriguing prospect, but maybe a big senior year has put him out of reach for another mid-major. I won’t mention a name in the hope that he shows up for a visit here in the near future. Not holding my breath, though. Looks Ganot is focusing on JC’s for instant help and to balance the classes. Here’s how the classes stack up for next year with 2 open scholies. 1 JC and 1 HS prospect would make for a nice balanced roster. With Thomas and Johnson entering their Sr years they definitely need to bring in another Big. An experienced point guard (JC?) and a young post (freshman?) would be nice. Heck, any player who will raise the talent level would be nice. Other schools on Verbalcommits offer 4 and 5 star recruits. Wait, no, that’s 5 and 4 star recruits. What could it hurt if we were to, well, maybe, try for a few of these? You know, to balance the roster. How about some balance? Their recruiting strategy is unlike Gib’s. They won’t (or don’t plan to) extend an offer until a prospect takes an official visit. They want to be sure that it’s a good fit on both sides — for the recruit and the program — and could use the input on how the current players feel about the prospect. Until then, the coaches continue to evaluate and vet prospects, and see how they fit their needs. He said it’s a fluid process because the list of transfers changes daily. That seemed to indicate they may be looking at either another grad transfer or an underclassman transfer who would sit a year and have at least two to play. The targets seem to be one big and one point guard, though Jacobsen did say they could also use a wing who can shoot. But that’s three players for two scholarships … unless someone isn’t returning. Hmmm. Thanks. It makes me think, is it cart before the horse or horse before the cart? All is well, at least until we have another season where everyone complains about the team talent. In any case, there are no excuses this year. One thing Gib did was at least make the bloggers feel like we were family. Ohana. Even if it was so simple that we might say, ‘hey, let’s get some good players!’, and Gib would respond, ‘Yep, we’re going to try to get some good players!’. I’m not happy with the isolation. Still I hope we’re get good enough to win. Hope Ganot doesn’t turn out to be another Chow. Go Bows ! I like the approach Ganot is taking especially after the Gib fiasco, you have to be a little more conservative. I have no info but it would be nice to get a big and a PG. I also feel like Lewis won’t be back based on what I saw at practices. So maybe we swap him out for a better perimeter threat. That would be the ideal situation. I don’t think it’s fair to mention Ganot’s name in the same sentence as Chow’s. PG 6-1, Marcus Shaver Jr. has an offer from UH. All expected back next season, the last i read from the beat writer. islandman: Thanks for the news on Shaver. Hope it’s true. He’s the player I was referring to in my post above five days ago. It was just wishful thinking, seeing as how he was just released from his NLI from UCSB. Shaver was named all-Arizona after averaging 22.4 points, 2.5 assists and 2.7 steals. He shot 55 from the field, and … get this … 52 percent (56 of 108) from 3. Who shoots 50 percent from 3-point range? Interesting … his coach was Mike Bibby. Bring him on a visit, and seal the deal. So sorry, but sometimes I get on a roll with these youtubes. Not often, but just when checking out a player someone mentioned. But the next player up looks really good, and just thinking we might talk to him before the tar heels make a pitch. Pretty exciting player, Zion Williamson. The D1 transfer lists are posted. Lots of players changing schools and it’s still March. Well, Jethro there is a 4 star prospect. Always wanted to cheer for somebody named Jethro. Can’t pronounce his last name anyway. Go Bows ! Go Jethro ! If the coaches are using this list, and haven’t already contacted the player, then just arrange them buy stars and start with the 5 and 4 star prospects. But of course it is just as good to go after the Zion Williamson’s and maybe better. If it is me, I would opt for the exciting players even if they head cases and just expect the coaches are up for the challenge. If we can’t get the perfect players, then go with the high risk high rewards. The guys who could use a good coaching staff. Zion Williamson is ESPN’s 2nd best player in the country haha. Think we gotta aim a little bit lower than that, although I agree we should aim high! Joe Pasternack,39, hired at UCSB. He was Associate Head Coach at Arizona for about 4 years. UCSB was recruiting Shavers earlier. Shavers signed an NLI in the fall with UCSB, then asked for a release from his commitment after Bob Williams was fired, and was granted the release a week or so ago. Doubt if he’ll be re-signing with UCSB, but who knows. At the time he signed with UCSB, I think Shavers was an under-the-radar prospect, but he had a huge senior season, and will now be a tough get for UH. But at least Ganot offered him, and Shavers’ past connections to the aina can’t hurt UH. Kendall Smith wants to transfer. Maybe looking for a title contending type team? He had earlier transferred from UNLV to CSUN. Marcus Shaver has a Hawaii connection as well. He use to go to Word of Life Academy when he was in elementary school. I think Kendall Smith would be a great lead guard if we could lure him. I also think that Matt Hubbard from SCU would fit well as a transfer in Ganot’s system. He’s a more physical pick and pop version of Purchase in my opinion. He also has a better post up game. Matt Hubbard ? Based on his stats, I don’t think so. Starting guards, Shaver and Smith? Go Bows ! !